If you’re looking for a photobooth for hire or are wondering where to rent a photo booth near Parsippany NJ for a wedding, bar mitzvah, bat mitzvah, sweet 16 or corporate event, look no further than “NJ Photo Booth Rentals.” Our luxury photo booth rentals are the ultimate blend of technology and art and are available for your Parsippany NJ party rental. Our fully enclosed photo booth was designed by the top manufacturer in the industry and crafted to meet our strict design standards. Encased in pearl white with frosted acrylic edging, our White Label Photo Booth was the recipiant of the multiple design awards and is continually described as the ultimate luxury photo booth for a wedding or other event. What makes our photo booth rentals Parsippany NJ different from the competition? Our booths aren’t some ugly pop-up tent in the back of your reception room or event space with a photographer inside taking pictures and maybe or maybe not printing them out. Our photo booths are completely automated, self-standing and enclosed. Much more than just a photo station, our enclosed Parsippany NJ photo booths are much more fun when the curtain is closed! So, the photos print out right there on the spot? That’s right, we use commercial-grade photo labs in our White Label Photo Booths that produce incredible quality prints in less than 10 seconds (the fastest print speeds on the planet!). But that’s not all! We’ll also give you a flash drive of all of the photos that were taken during your event so you can revisit the memories of your Parsippany NJ wedding or event whenever you feel like it! Your friends and family will be coming to your Parsippany NJ wedding from all over and will be thrilled that they will be able to have their photos taken in a comfortable setting with people they either haven’t seen in forever or new friends they’ve just met. We also do video! Our video booths are capable of recording Hi-Def video messages of all of your guests traveling to Parsippany NJ for your event. Want a video guest book? This is the ultimate way to do it! We give you props! Our rentals always come with photo booth props if you ask. We feel that the more props your guests have to “act goofy” the better their experience will be! Our Parsippany NJ photo booth rentals are also completely automated. That means, your attendant is there just to help your guests and keep things running smoothly. The booth will do the rest! Your guests will walk into the booth, sit down on the white leather seating, and follow the on-screen touchscreen instructions! It’s that simple. We have perfected and streamlined the guest experience with our photo booth rentals and are excited to share the experience with as many people as we can! We also do scrapbooks! Our beautiful scrapbooks are there next to your booth (if you so desire) for your guests to put together as the night goes on. We provide the scrapbook album, glue, pretty markers, paper stock, and other scrapbooking tools to make the ultimate coffee table reader. This is a book that you’ll pick up 20 years from now and be able to revisit your event and all of the memories that were created. Also, don’t forget, we also give you a flash drive that contains copies of all of the photos that were taken throughout the evening that you’ll be able to view whenever you’d like. We’re social! Your Parsippany NJ photo booth rental can include wireless uploads to Facebook and beyond. Share the moments as they happen with your social media circle! Smile, Flash, Click, Tag, and Share! Repost the photos as your desire. Alternatively, we also can put your events photos in an online album that you can share with your guests which they can download and share as they so please. We’re super easy to work with. 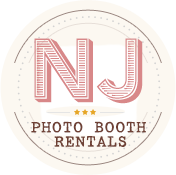 If you’re looking to rent a photo booth in Parsippany NJ, you need to give us a call. Seriously. (856) 336-8742 is your hotline to the easiest decision you’ll ever make regarding your event. We promise a no-hassle, easy conversation that will answer any and all of your questions regarding your NJ photo booth rental.